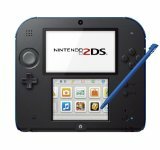 Nintendo 2DS - Electric Blue.. Product weight is 0.56 lbs. I'm a huge fan of the original Nintendo DS and was a bit put out when they released the 3DS and 3DS XL. Frankly, I am not a fan of 3D- whether in video games or movies- and think it's really unnecessary. As time went on after the 3DS release, I began seeing more and more games I wanted to play that were not compatible w/ my DS. Imagine my delight when Nintendo announced the 2DS at a cheaper price!I received the 2DS on Saturday along with two 3D games and am very, very happy with the devic..
For those who have followed Nintendo Handhelds, the very idea that they'd release so many different versions of one handheld is nothing new. The original Gameboy eventually had the Gameboy Pocket and then Gameboy Color. The Gameboy Advance had the SP and the Micro. The DS had the original release, the lite, the DSi and the DSi XL. The 3DS already has the original and the XL. It seemed strange that so soon after the launch of the 3DS XL we'd find ourselves with another DS ..
Nintendo's 3DS handheld has quickly become one of my all-time favorite gaming devices. We're only two and a half years into the console's lifespan, and we've already been treated to several masterpieces so good, they can easily compete with and defeat many home console releases in terms of quality and overall excellence. It has also been a hugely successful venture for Nintendo, but some people have still held off from buying one. Why? Maybe it's the price that has kept people away. Perha..